A “liquid canvas abstract” is a floating painting — an artistic expression of color and form on a liquid “canvas” using oil-based pigments. The evanescent image is preserved photographically in high resolution. No digital construction is involved. I had the idea for a liquid canvas about 20 years ago, but I was too busy with other projects to do much with it. Fortunately, a good idea lives on. Two years ago, I came back to this one. And now I’m excited to share the results with you. So far, the response has been more than I could have hoped for. Adjectives like “beautiful,” “stunning,” and “fantastic” have inspired me to work in this medium with ever greater depth of purpose. 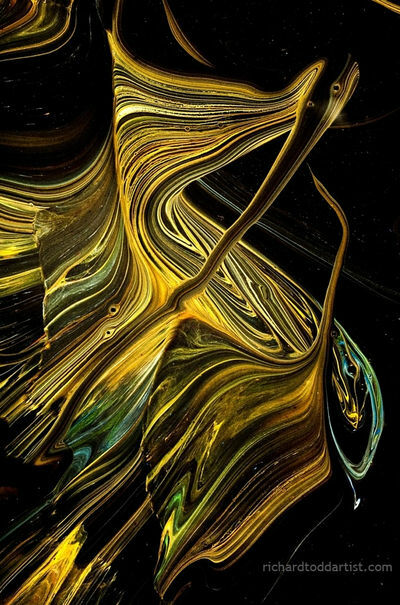 The paintings are a combination of artistic technique and the uncontrollable physics of fluids in motion, creating a unique cacophony of form, light, and color. The paintings are so ephemeral that they last only seconds. I use fine art photography to give them the permanence they deserve. Richard really describes his work well and very concisely, too. But still, there’s a few things I’d like to add: The Confluence of Ancient and Modern. Yes, if I understand what he’s describing properly, he’s doing a variation of the ancient marble paper making technique. What’s different is that he’s using photography to capture the imagery rather than laying a sheet of paper over the painted matrix. The result of this, if you think carefully, is to produce a 3D version of the marbled imagery instead of the flat, paper version of the ancient method. 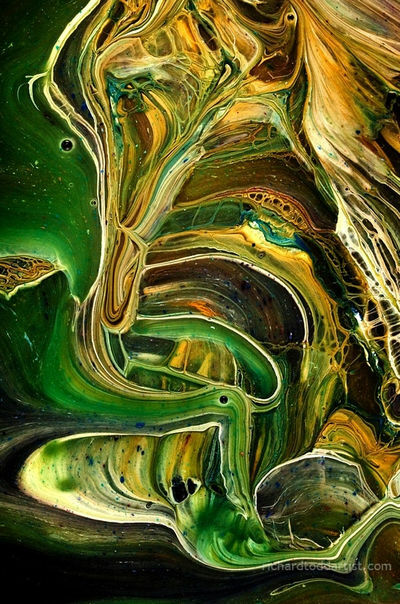 Photography captures the paint that is below the surface as well as on top of it. I’m pleased to be able to offer a level of print quality commensurate with the paintings themselves. I doubt there’s a better printer than the Epson 9900. Combined with Moab’s Entrada Gloss paper or Innova’s Ultra Gloss canvas, the resulting images are truly beautiful. It’s an interesting digital twist to an ancient artform: the results of both methods are a flat, very ornate, long lasting image. There’s many more to look at in his Galleries and Collections section, as well as in the flash applet on the home page. We are soon invited in to have tea with a friendly turk. What do you know? On the television is a show all about the Turkish art of painting on a gelatinous surface. Fortunately it’s a very visual demonstration so our inability to speak Turkish is not a problem. Art is the universal language. Tea is pretty widely understood too. Looks pretty easy doesn’t it? Apophysis is even easier though. Here’s a more sophisticated example which incorporates the actual painting of an object in the paint film and not merely the creation of an ornate background. I find Richard Todd’s work interesting not just because it looks so good, but because it’s an advancement of an ancient art. Not only that, stop me if I’m wrong, but I think fractals can be considered a new technique for dripping and swirling paint. 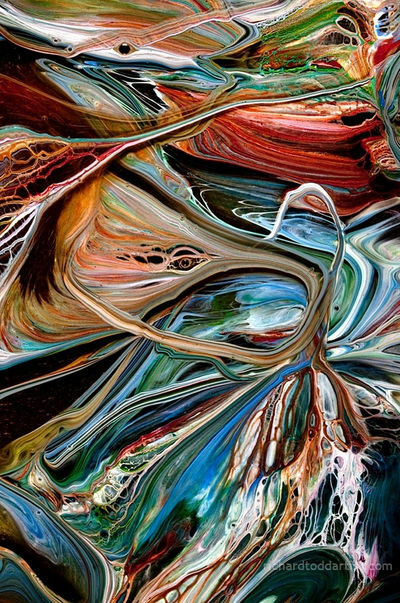 A special thanks to Paul N. Lee, the veteran fractal archivist, for alerting me to Richard Todd’s Liquid Canvas Abstracts. Globalization and internet is a funny thing. I was born and raised in Istanbul, and yet my discovery of fractals predates my discovery of ebru by at least 4 years. I really suggest that you seek an opportunity to try it, it’s the perfect meditation tool, more so if you appreciate abstract art. Also, lovely features from Richard Todd.